The application of fingerprinting techniques to relational data cannot protect personal information against a collusion attack, in which the attacker has access to a set of published data. 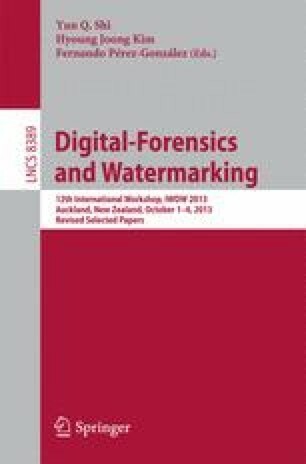 The general fingerprinting techniques such as Li et at.’s, Guo et al.’s, and Schrittwieser et al.’s focus on detecting the traitor, who leaked the data. Among them, Schrittwieser et al.’s fingerprinting technique combines \(k\)-anonymity and full-domain generalization in order to not only detect traitors but also protect personal records. However, the technique has two main limitations. First, it does not allow the data provider to insert or delete records from the original data. Secondly, it does not create enough fingerprints for data recipients. To overcome these limitations, in this paper, we propose an (\(\alpha ,k\))-privacy protection model, an extension of \(m\)-invariance and (\(\alpha , k\))-anonymity, and a new top-down (\(\alpha , k\))-privacy fingerprinting algorithm based on that model. The model not only protects sensitive personal information against collusion attacks but also allows data providers to republish their updated original data without degrading the privacy protection. The algorithm embeds fingerprints in the generalized data and extracts them from leaked data to detect the traitors. We extensively evaluate the proposed algorithm on our own built software. The evaluation results show that our algorithm creates more fingerprints than Schrittwieser et al.’s algorithm (64000 vs 1536) while achieving the same generalized data quality. Moreover, our (\(\alpha , k\))-privacy algorithm creates generalized data even in the case of having small number of distinct sensitive values in the original data without adding faked records as in \(m\)-invariance.